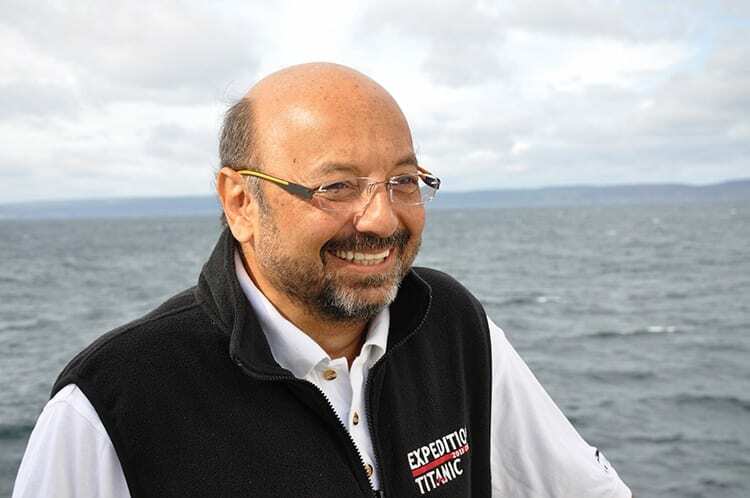 The Explorers Club has chosen David Gallo, Director of Special Projects at the Woods Hole Oceanographic Institution (WHOI), as one of the recipients of this year’s Lowell Thomas Award. He is among six recipients who will be honored for their “imagination in exploration” at a dinner on October 11, 2014, at the Bowers Museum in Southern California. Named after renowned broadcast journalist, filmmaker and explorer, the Lowell Thomas Award was first given in 1980 to mark the 75th anniversary of the Explorers Club— an organization dedicated to scientific exploration of land, sea, air, and space. It is now awarded annually to outstanding individuals chosen for their extraordinary contributions to the fields of scientific research and exploration. Past recipients of the award include oceanographers Sylvia Earle and Robert Ballard, astronomer Carl Sagan, and filmmaker David Attenborough. A true pioneer at the forefront of ocean exploration, Gallo is one of the first oceanographers to use both manned submersibles and robots to map the ocean world on diverse expeditions. He first came to WHOI in 1987 when he was invited by Robert Ballard to join his team as the Assistant Director of the Center for Marine Exploration. Gallo was co-expedition leader in the successful international search that found the remains of the missing aircraft, Air France 447, in 2011. The search team deployed unmanned underwater vehicles to scan the 2.5-mile deep and rocky underwater terrain off Brazil’s northeast coast and located the wreck site two years after the plane disappeared. In 2010, he co-led an expedition to develop the first comprehensive map of the RMS Titanic. He was also a member of the team that explored the German battleship Bismarck using the Russian MIR submarines, and an expedition to find the lost WWII submarine USS Grunion. Gallo is presently involved in planning the next generation of deep-sea explorations that will utilize a suite of innovative imaging and visualization technologies. Passionate and dedicated to communicating the importance of science and engineering to the public, Gallo has lectured extensively both nationally and internationally to audiences ranging from elementary school children through CEOs, and has participated in numerous television and radio broadcasts. His classic talk from TED 2007, “Underwater Astonishments,” has been viewed online more than 11 million times and is included in the “11 Must-See TED Talks” and “The Most Popular Talks of All Time” lists on the organization’s web site. “Dave Gallo is a pre-eminent explorer, explainer and exponent of ocean science and all its importance to the planet and everything on it. From the basics of plate tectonics to the technical details of finding lost airplanes, Gallo combines science expertise with a gift for clear and compelling communication,” said Larry Madin, Executive Vice President and Director of Research at WHOI. In 2009, Gallo was elected a Fellow of the American Association for the Advancement of Science for his role in science communications. Active in encouraging the development of new technologies for ocean exploration, he is also a member of James Cameron’s Deep Ocean Task Force and the XPrize Ocean Advisory Board. He received bachelors and masters degrees in geological science from the State University of New York at Albany and a Ph.D. in oceanography from the University of Rhode Island. The Explorers Club was founded in New York City 1904 by a group of the world’s leading explorers of the time. With 3,000 members worldwide, It is a multidisciplinary, not for profit 501(c)(3) organization dedicated to scientific exploration of land, sea, air, and space by supporting research and education in the physical, natural and biological sciences. The Club’s members have been responsible for an illustrious series of famous firsts: First to the North Pole, first to the South Pole, first to the summit of Mount Everest, first to the deepest point in the ocean, and first to the surface of the moon. A search team led by the Woods Hole Oceanographic Institution (WHOI) has located the wreckage of Air France Flight 447 some 3,900 meters, or nearly 2.5 miles, below the surface of the Atlantic Ocean. Newly released images of the Titanic wreck site provide the first unrestricted view of the world’s most notable maritime heritage site.